Two weeks shy of the election, Barack Obama has announced he is leaving the campaign trail for two days to see his ill grandmother in Hawaii. The candidate's spokesman, Robert Gibbs, released the following statement to People magazine regarding Obama's decision: "Senator Obama's grandmother, Madelyn Dunham, has always been one of the most important people in his life. Along with his mother and his grandfather, she raised him in Hawaii from the time he was born until the moment he left for college. As he said at the Democratic Convention, she poured everything she had into him." He adds, "Recently, his grandmother has become ill, and in the last few weeks, her health has deteriorated to the point where her situation is very serious. It is for that reason that Senator Obama has decided to change his schedule on Thursday and Friday so that he can see her and spend some time with her." 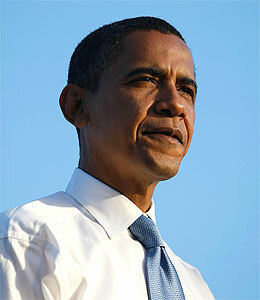 Barack's wife Michelle is set to take her husband's place in Ohio, which is considered a battleground state. Obama will resume campaigning on Saturday. UPDATE: The Associated Press has learned that Obama's grandmother broke her hip.